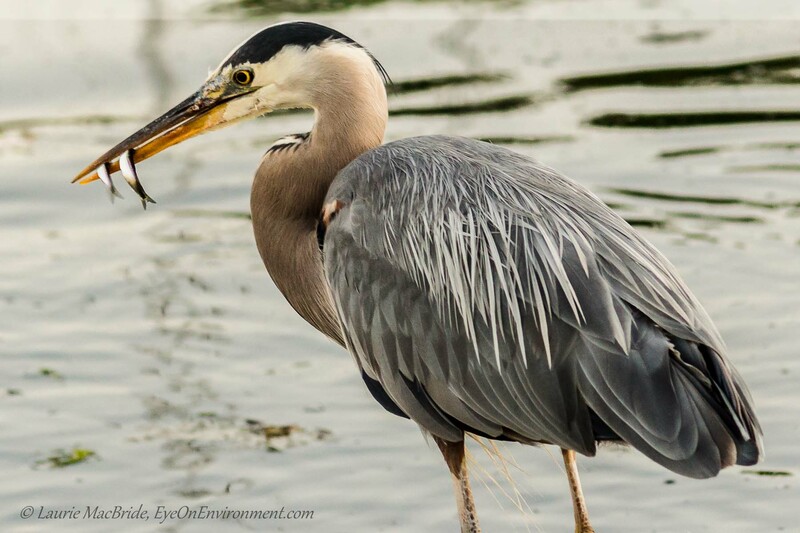 The Great Blue heron relies on stealth and lightning quick reactions to catch its dinner – along with amazing eyesight. Its eyesight is about three times more detailed than ours, and its binocular vision gives it very good depth perception. It also has a built in “zoom lens” – allowing the bird to switch instantaneously between telescopic and macro vision (probably as good or better than our fanciest modern camera lenses). If we lowly humans were in the same situation as the bird in these photos, most of us would starve, at least without the aid of polarizing sunglasses and decent fishing gear. Staring into the water, we’d be thrown off by the glare, the surface motion and the dominance of our own reflection. Even if we were able to spot a fish, we’d have a hard time judging its exact location because the refracted light would distort our angle of view. The bird in these photos may have been managing to reduce the glare and distortion by extending its long neck and tilting its head to bring its bill almost straight down. If so, the trick worked, as we watched it catch two, three and sometimes even more fish with each rapid thrust of its elegant beak. In an earlier post I wrote about BC’s coastal Great Blue herons and why they’re a species at risk here in the Strait of Georgia. Luckily, many have managed to adapt to our increasingly urban environment. 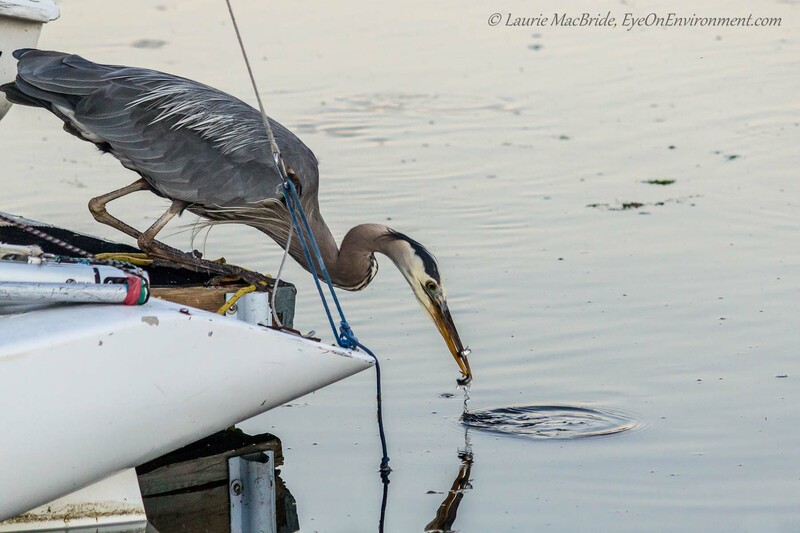 For example, you can often find a Great Blue heron like the one in these photos, using a dock in a quiet corner of a marina as a handy viewing and fishing platform – affording humans a bird’s-eye view of this awesome fisherman in action. 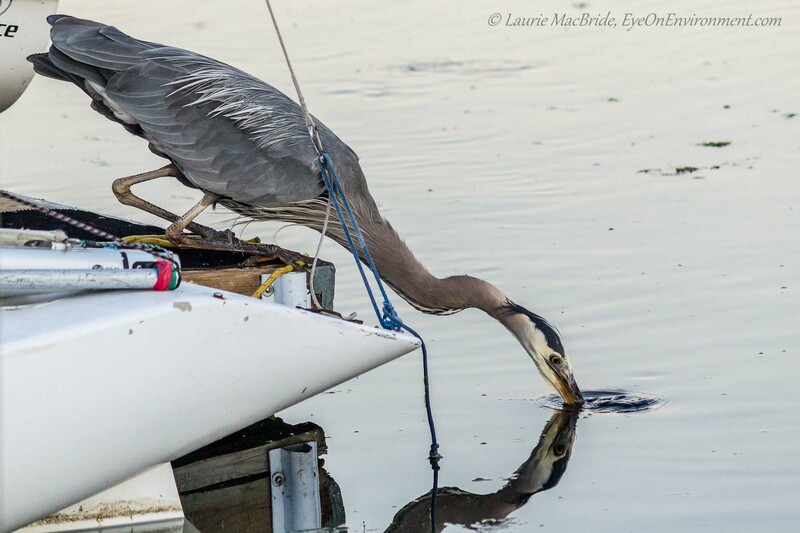 Posted by Laurie MacBride, Eye on Environment on November 25, 2015 in Animals & Wildlife, BC coast, Birds, South Coast & Vancouver Island and tagged animal behavior, feeding, fishing, herons, nature, photos, reflections, shorebirds, species at risk, Strait of Georgia, vision. Thanks very much for visiting and commenting, Martin! Birds – especially waterbirds – are very precious and fascinating, for sure. Glad to hear their populations are healthy in your area. Long may they be so! Great shots… as usual Laurie. Herons are so hard to photograph! Very nice photos! The colours are great too. Thanks ehpem! These were taken in your neck of the woods – the RVYC docks in Cadboro Bay, where we were staying for a few days on our boat. Herons are damned tricky to photograph well…but you’ve done it! Kudus, your shots are, as usual, brilliant. Thanks so much, Fred! Glad you like ’em. Thanks Laurie for this post and your lovely photos honouring these amazing birds. I was so sad and angry when I read about the 30 GBHs that died at Syncrude’s Mildred Lake tailings “pond” on August 30. And thanks also for your kind words, Sharon! Beautiful photos of an amazing bird. Thanks for visiting the blog, and for your kind words! They are impressive birds, for sure. Wonderful captures of a majestic bird!